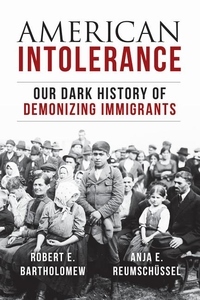 The authors document abuses against Catholics in the early 19th century in response to the influx of German and Irish immigrants; hostility against Mexicans throughout the Southwest, where signs in bars and restaurants read, "No Dogs, No Negros, No Mexicans"; "yellow peril" fears leading to a ban on Chinese immigration for ten years; punitive measures against Native Americans traditions, which became punishable by fines and hard labor; the persecution of German Americans during World War I and Japanese Americans during World War II; the refusal to admit Jewish refugees of the Holocaust; and the ongoing legacy of mistreating African Americans from slavery to the injustices of the present day. Though the authors note that the United States has accepted tens of millions of immigrants during its relatively short existence, its troubling history of persecution is often overlooked. President Donald Trump's targeting of Muslim and Mexican immigrants is just the most recent chapter in a long, sad history of social panics about "evil" foreigners who are made scapegoats due to their ethnicity or religious beliefs.